"A time and place of magic and miracles." Ismail Merchant, more often the producing part of the Merchant-Ivory team, takes over the directing reins with The Mystic Masseur, the lighthearted story of an aspiring Indian author who became a famous healer in 1940s-era Trinidad, the Indian community that was ruled by the British Empire and established to provide cheap labor in the West Indies. 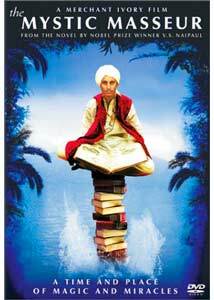 Ganesh (Aasif Mandvi) is a schoolteacher preoccupied with reading to the point of distraction. He fancies himself an intellectual, and when a friend tells him he ought to write his own book, he becomes convinced that he will soon produce a work of art. His simplistic tomes (101 Questions About the Hindu Religion) do little to increase his fame�particularly considering that they are printed on shoddy paper and distributed by hand, mostly to begrudging family members. Desperate to make a name for himself, Ganesh takes up the mantle of his father, renowned as a masseuse with healing hands, and constructs the persona of a mystic, able to chase away spirits and cure aches and pains. Mandvi's Ganesh isn't a manipulator, and he isn't trying to dupe people. His wide-eyed enthusiasm and ambition aren't in any way malicious; he is simply someone who has put too much faith into his meager talents, and has listened too closely to the praise of his family and friends. Much of the humor in the story comes from the scheming of his wife Leela (Ayesha Dharker), who has the good sense to cash in on her husband's fame by arranging for her father, Ramlogan (Om Puri), to purchase the cabs that transport the people to Ganesh's hard-to-reach home. Ganesh is furious when he discovers his wife's scheme, and only furthers his longstanding feud with his father-in-law (begun when Ramlogan took great offense when Ganesh did not dedicate his first book to him). The family drama and the emphasis on Indian culture and tradition forms the heart of the story, which is a relief, as Ganesh's journey is certainly not a happy one. Well-established as a local wise man, he is elected to Parliament, but in the city, his homespun wisdom has little effect; he is soon labeled a charlatan and shipped off to Oxford as part of a cultural exchange program. The movie is told largely in flashback, narrated by a young Indian man studying at Oxford who was healed by Ganesh at a young age. When he meets the defeated mystic at the train in England, he discovers not the larger-than-life sage he remembered, but a broken dreamer, consumed and discarded by the British Colonial system. Caryl Phillips' screenplay is based on the 1957 novel by Nobel Laureate V.S. Naipaul, and it retains the weighty air of a work of literature. I'm not convinced, however, that it retains the thematic richness of a good novel. It seems like the story of Ganesh is intended to make some grand point about the evils of colonialism, or the difficulties of finding a place in a displaced culture (the Indians in Trinidad found themselves among Africans and Englishmen, but few who knew their way of life). Such themes are not particularly well-developed, and what is, in essence, a small, human story takes far too long to develop, yet it still feels too sketchy and unfocused (particularly during Ganesh's reign as a mystic). On the other hand, the film is a visual treat, and the rich cultural landscape is captured with a full palette reminiscent of Mira Nair's Monsoon Wedding The characters, too, are charming and engaging. Unfortunately, like Ganesh, The Mystic Masseur is a little too pleased with itself, a little too confident of its own wisdom. Image Transfer Review: This is a wonderful transfer that more than does justice to the beautiful photography. Colors are full, natural, and well-rendered. Fine detail is good, and there is little evidence of artifacting, even on complex textures. Black level is good, as is shadow detail. I spotted a bit of edge enhancement, but only a bit. Source material is clean as well, and shows little grain and only the occasional fleck of dirt. Audio Transfer Review: The 5.1 English mix is serviceable throughout. Dialogue is clear and anchored in the center channel. Most of the audio is mixed to the front soundstage, and from there, most into the center channel, but the score is nicely mixed into the front mains. During crowd scenes and rainstorms, the surrounds come alive to offer atmospheric enhancement. For a simple, dialogue-based film, this isn't a bad presentation at all. Extras Review: The only included extras are trailers for the loosely related Lagaan and Secret Ballot. The Mystic Masseur is a lavishly mounted visual treat, but that, and the entertaining cast of characters, can't quite overcome a meandering, languorously paced script. Columbia TriStar's DVD is up to their standards in terms of audio and visual quality, but the lack of supplemental material is a bit of a disappointment.